Through this test, it can be determined whether the trouble occurs in the electrical circuit or if it is a mechanical problem in the transaxle. If any abnormalities are found in the following test, the problem is in the transaxle itself. Disconnect the connector of the transmission wire. It is possible to deactivate the electrical shift control by disconnecting the transmission wire. The gear positions can then be changed mechanically with the shift lever. Drive with the transmission wire disconnected. Move the shift lever to each position to check whether the gear position changes as shown in the table below. Connect the connector of the transmission wire. Clear the dtc (see page ax-29). 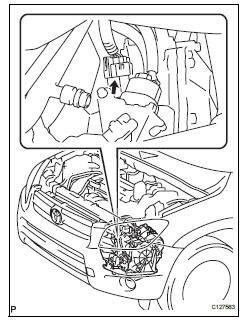 Perform the reset memory procedures (a/t initialization) when replacing the automatic transaxle assembly, engine assembly or ecm. Reset memory can be performed only with the intelligent tester. The ecm memorizes the vehicle conditions when the ect controls the automatic transaxle assembly and engine assembly. Therefore, when the automatic transaxle assembly, engine assembly, or ecm has been replaced, it is necessary to reset the memory so that the ecm can memorize the new information. The reset procedures are as follows. Enter the following menus: diagnosis / enhanced obd ii. 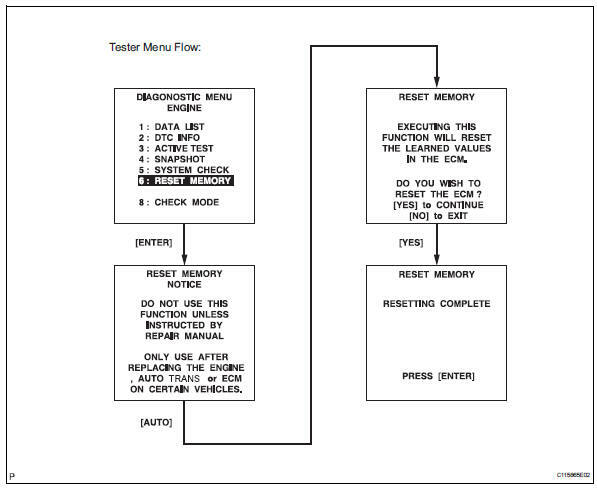 After performing the reset memory procedures, be sure to perform the road test (see page ax-12) as described earlier. The ecm learns through the road test.